Paraskevi Heldin Ph.D: Dr. Heldin received her B. Sci. exam in 1979 at Uppsala University and her Ph.D. in 1987 in Medical and Physiological Chemistry for studies on regulatory phosphorylation of proteins, also at Uppsala University. After dissertation she changed research direction and focused on the biology of hyaluronan under the supervision of Professor T. C. Laurent, Uppsala University. 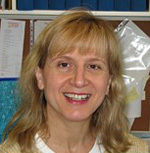 She worked in different positions at the Department of Medical and Physiological Chemistry during 1987- 2000. Since 2001, she is Adjunct Associate Professor at the Department of Medical Biochemistry and Microbiology, and Associate Investigator and Head of the Matrix Biology Group at the Ludwig Institute for Cancer Research, Uppsala, Sweden. Dr. Heldin’s interests are focused on understanding the mechanisms of how hyaluronan-CD44 complexes interact with the receptors for the growth factors PDGF and TGFβ for modulation of the proliferative and invasive behavior of malignant cells. Hyaluronan is a glycosaminoglycan found in tissues as well as in body fluids, and has a key role in tissue organization and homeostasis. It is one of the most hygroscopic macromolecules in nature, and it can entangle and form viscoelastic meshworks that can partition stroma into aqueous and viscous compartments. Hyaluronan is synthesized by mesenchymal, epithelial and immune cells, as well as by mesenchymal and hematopoietic stem cells1-3. Its abundance and size vary due to changes in the activities of hyaluronan synthesizing (HAS1, 2 and 3) and degrading (HYAL1, 2 and 3; PH-20) enzymes (reviews in this series and4-7). Hyaluronan is also sequestered and internalized by hyaluronan binding proteins, the hyaladherins, including CD44 and RHAMM (reviews in this series and8). Hyaluronan molecules are extruded into the extracellular matrix (ECM) in coordination with their synthesis, but they also exist intracellularly9 (Fig. 1A). Hyaluronan molecules interact with each other or with hyaladherins and form a variety of structures that can act as stimuli promoting motility, proliferation, attachment and/or activation of cells (reviews in this series and10). The mechanisms regulating extracellular versus intracellular location of hyaluronan and the function of intracellular hyaluronan are not known. Increased synthesis of hyaluronan is often seen in association with elevated activities of growth factors and cytokines that are released in rapidly remodeling tissues during embryonic development and in certain pathological situations such as inflammation and tumor progression. The levels of hyaluronan have diagnostic or prognostic significance in several aggressive cancers, such as mesotheliomas and breast cancer, as well as in chronic inflammation, for example rheumatoid arthritis. This review will focus on the progress of research on growth factor regulation of hyaluronan biosynthesis and its physiological and pathophysiological relevance. (A) Detection of intracellular hyaluronan (green) by staining of breast cancer cells (MDA-MB-231) with a biotinylated-hyaluronan binding probe. Staining for CD44 at the plasma membrane was done with Hermes-3 antibody (red); the picture was supplied by Angelos Heldin. (B) Detection of pericellular hyaluronan surrounding a normal human mesothelial cell by the exclusion of formalin fixed erythrocytes. A large number of studies indicate that chronic inflammation promotes malignant transformation and that the tumor-host microenvironment regulates tumor progression11. At all stages of tumorigenesis, stromal cells including endothelial cells, pericytes, fibroblasts, mesothelial cells and immune cells become “activated” and release growth factors and ECM constituents. During all these phases, the contents of high and intermediate size of hyaluronan chains, as well as short hyaluronan fragments, increases. It has also become clear that hyaluronan achieves different functions depending upon its size and the nature of bound proteins (see related reviews in this series and12 ). Immunohistochemical studies on tumor tissue samples from different origin and degree of malignancy, demonstrated that stromal hyaluronan levels are correlated with tumor aggressiveness13, 14. The functional importance of stromal hyaluronan in cancer progression has being studied by Koyama et al., using a conditional transgenic mouse model of breast cancer in which hyaluronan accumulates due to overexpression of HAS2. In this model, hyaluronan overexpression led to a faster development of tumors, promotion of angiogenesis and lymphangiogenesis, and recruitment of stromal cells15, 16. Possibly, hyaluronan that was synthesized by the mammary tumor cells affected their malignant phenotype through its interactions with tumor cell-expressed hyaladherins, such as CD44, inducing the activation of intracellular signaling events. Furthermore, microenvironmental hyaluronan may have mediated the recruitment and activation of various cell types, e.g., mesenchymal stem cells, endothelial cells and immune cells, both through its ability to create viscoelastic porous meshworks permissive for cell migration, and through its interactions with stromal cell-expressed hyaladherins. Additionally, the recruited stromal cells most likely secrete growth factors and cytokines that in an autocrine and/or paracrine manner increase hyaluronan synthesis by both stromal and tumor cells, thereby triggering further signaling events that affect cell proliferation, migration, differentiation and transcriptional activation. Hyaluronan-containing pericellular matrices or “coats” around stromal cells, such as mesothelial cells (Fig. 1B), are formed in response to growth factors, for example platelet-derived growth factor (PDGF)-BB and epidermal growth factor (EGF). However, TGF-β does not induce the formation of the coat as efficiently, suggesting that growth factors possess different regulatory roles on coat assembly. The coat consists of newly synthesized hyaluronan still attached to the cell via its synthase as it is extruded into the extracellular space, as in mesothelial cells17, or attached to cell surface CD44, as in chondrocytes (see review by Knudson W. and Knudson C. in this series and18). These hyaluronidase-sensitive matrices may act as protective barriers around normal cells19, as well as around tumor cells20. An interesting question is whether such coats exist in vivo and, if so, how they contribute to the progression of cancer by forming, promoting or protecting “niches” during tumorigenesis. Interestingly, hepatocyte growth factor (HGF) and β-catenin, known to promote epithelial-mesenchymal transition (EMT), stimulate hyaluronan production and the assembly of pericellular matrices 21. It will be interesting to explore whether the formation of hyaluronan-containing pericellular matrices is involved in the induction of EMT by causing displacement of adhesion molecules, facilitating cell detachment, growth and migration. Further studies on the mechanisms of coat formation and its functional significance are needed. A wealth of data has been accumulated from studies since 1970s by B. Toole and co-workers on the importance of cell and/or tissue hyaluronan in physiological and pathological situations such as embryonic development and tumorigenesis (22-25 and references herein), which has begun to unravel the complex biological roles of hyaluronan in cellular behavior. Growth factors released by stromal or adjacent cancer cells, such as PDGF and transforming growth factor (TGF)-β, via activation of their receptors cause increased production of matrix molecules, which then via activation of cell surface adhesion receptors augment signaling. It is now apparent that accumulation of stromal hyaluronan in response to growth factors modulates the activation state of growth factor receptors through binding to cell surface hyaladherins, such as CD448, 26-28. For example, we found that hyaluronan-activated CD44 inhibits PDGF-BB-induced stimulation of the PDGF β-receptor and PDGF-BB-mediated fibroblast migration. Most likely, the CD44-hyaluronan complex recruits a tyrosine phosphatase to the PDGF β-receptor and thus down-modulates its activity28. Such interplay between hyaluronan-activated CD44, PDGF β-receptor and PDGF-BB may be physiologically relevant during wound healing, where both hyaluronan and PDGF co-exist in vivo and tightly collaborate to control fibroblast motility. Importantly, mice in which CD44 is conditionally down-regulated in skin exhibit impaired hyaluronan metabolism and delayed wound healing29. Furthermore, stimulation of immortalized renal proximal tubular epithelial cells (HK-2) with hyaluronan attenuates TGF-β signaling30. There are other examples of receptors for extracellular molecules that can suppress the activities of receptor tyrosine kinases. For example, integrin α1β1 attenuates EGF receptor activity through activation of T cell protein tyrosine phosphatase, TC-PTP31. CD44 responds to extracellular cues and can function as a tumor suppressor, but more frequently acts as a growth- and invasiveness-promoting molecule. Some of the effects of CD44 are hyaluronan-dependent whereas others are independent of hyaluronan26-28, 32. Endogenously generated hyaluronan activates the receptors for different growth factors, including ErbB2 and PDGF receptors, contributing to proliferation and multiple drug resistance in tumor cells24, 33, 34. Thus, the concept that ligand binding to growth factor receptors alone regulates cellular functions is most likely simplistic. More frequently, they cooperate with CD44 or other cell surface adhesion receptors and act synergistically in modulating cell fate, in a cell type-dependent manner. Angiogenesis is the formation of new blood vessels from pre-existing vasculature. Physiological angiogenesis is required during embryogenesis and wound healing as well as the female reproductive cycle, and is characterized by the correct formation of new blood vessels. However, in several pathologies, such as cancer and diabetic retinopathy, vessels are formed in excessive amounts and are disorganized. These highly complex processes are regulated by the concerted action of several factors including fibroblast growth factor (FGF)-2, vascular endothelial growth factor (VEGF) and PDGF35-37. In addition, basement membrane and ECM components or fragments thereof play key roles in the angiogenic processes38, 39. Inflammatory reactions are accompanied by an accumulation of hyaluronan of polydisperse size, via increased activation of HYALs in response, for example, to TGF-β and/or exposure to oxidative and nitrative species1, 40. Several studies have demonstrated that short hyaluronan fragments stimulate angiogenesis via binding to CD44 and RHAMM39, 41-43. The downstream signaling pathways through which complexes of hyaluronan fragments with CD44 or RHAMM induce angiogenesis are still relatively unknown, and most likely involve the co-operation of a variety of growth factor receptors. Recently, using a microarray approach, the gene expression profiles of mouse brain capillary microvascular endothelial cells were compared after treatment of the cells with hyaluronan dodecasacharides (HA12) or the known angiogenic factor FGF-244. The analysis revealed that 37 genes were up-regulated in common after stimulation with HA12 or FGF-2. Fifty six genes were up-regulated only by HA12 and 83 genes only by FGF-2. Among the genes up-regulated in common were ornithine decarboxylase (Odc) and ornithine decarboxylase antizyme inhibitor (Oazi). Their co-ordinated induction is central in regulation of angiogenesis, most likely through the maintenance of active Odc protein and thereby polyamine-induced endothelial cell proliferation and endostatin suppression. Among the genes uniquely up-regulated by hyaluronan oligosaccharides was the growth regulated oncogene 1 (Gro1) gene (also designated as chemokine ligand 1, CXCL1; human homolog, IL-8). Gro1/CXCL1 activates the chemokine receptor CXCR2, which promotes angiogenesis. Binding of HA12 to CD44 was necessary to trigger the activation of CXCR2 and subsequent endothelial cell differentiation. Interestingly, both FGF-2 and HA12 induce the expression of HAS2 transcripts in endothelial cell cultures during active tubulogenesis, suggesting that depolymerization of hyaluronan by the action of local hyaluronidases can stimulate active endothelial cells to undergo differentiation in an autocrine manner. In this context, it is important to point out that over-expression of HAS2 in Neu-initiated breast tumors promotes tumor angiogenesis most likely through the induction of the pro-angiogenic factors, FGF-2 and stroma-derived factor (SDF)-1α / CXCL1215. Thus, augmentation of tumor angiogenesis, most likely requires the cooperative action of both pro-angiogenic factors and matrix molecules, such as hyaluronan fragments. Mammalian HASs and HYALs were cloned in the 1990s. However, comparatively little is known about their regulation, function and biochemistry (see related reviews in this series and references herein). Given that hyaluronan contributes in many ways in inflammation and tumorigenesis, manipulation of HASs or HYALs to control cellular hyaluronan levels represents a means of modulating disease progression. Several laboratories, including our own, have investigated the effects of modifying expression of HAS and/or HYAL proteins in normal and transformed cell lines as well as in animal models. Functional differences between the three HAS isoforms and their ability to alter cellular behavior were studied in stably transfected CHO cells45 and COS-1 or 3Y1 cells46. Our studies on CHO cells revealed differences in the catalytic activities of the three HAS transfectants; HAS1-transfected CHO clones exhibited 4- and 10-fold lower hyaluronan synthesizing capacity than the HAS2 and HAS3 transfectants, respectively. Most likely, HAS1 transcripts are short-lived or expressed at low levels, explaining the low number of HAS1-transfectants that could be detected. However, although HAS1 mRNA is poorly expressed in several normal cells (except normal human mesothelial cells47) and in breast cancer cells (about 10-fold lower expression levels than HAS2 and HAS3 genes48), excessive expression of HAS1 and its splicing variants has been detected in multiple myeloma patients with poor outcome49. Notably, increased HAS1 transcription was also detected in malignant 3Y1 fibroblasts upon transformation with the oncogenes v-src and/or v-fos50. The HAS1 promoter has binding sites for transcription factors such as CREB, NFkB, IRF-1 and p53, whose mutations and abnormal expressions augment the malignant phenotype of tumor cells. These observations and the above findings strengthen the hypothesis that HAS1 genes are involved in cell cycle growth progression and their expression is promoted by transformation, depending on the cell type and physiological status. Notably, the HAS1Va variant has been correlated with production of extracellular hyaluronan and HAS1Vb with generation of intracellular hyaluronan49. More recently, Rilla et al.51 demonstrated that plasma membrane localization of GFP-HAS2 and HAS3 is coupled to their enzymatic activity, and that large pools of HAS2 and HAS3 are seen within the cytoplasm of the epidermal keratinocyte cell line, REK. We have also observed an intracellular and plasma membrane distribution of over-expressed Flag-HAS2 in COS-1 cells (Fig. 2); this pattern of distribution occurred in a range of 0.5 - 4 µg of the transfected transcripts (unpublished observation). It is unclear why there are intracellular pools of HAS2 and HAS3 in these cells. It is possible that HAS stability, intracellular trafficking and translocation to the plasma membrane can be regulated by external signals. Flag-HAS2-transfected cells. The arrow heads indicate the location of Flag-HAS2 intracellularly and at plasma membrane protrusions; the picture was supplied by Aino Ruusula. Further studies on CHO-transfectants revealed that endogenous production of 1 µg hyaluronan / 1x105 cells / 24 h was the lowest limit for the formation of hyaluronan-rich matrices in the absence of proteoglycans45. Transfectants producing 4-fold lower amounts of hyaluronan required the stabilizing effect of added aggrecan for the formation of the hyaluronan coat. Most interestingly, at the higher concentrations of newly synthesized hyaluronan, an inverse correlation between hyaluronan production and cell migration as well as CD44 expression, was observed. Another interesting observation was that in cells, each one of the three HAS proteins synthesized hyaluronan molecules of large molecular mass (larger than 3.9 x 106 Da). In cell-free preparations, however, HAS2 protein generated large chains (larger than 3.9 x 106 Da), whereas HAS3 generated polydisperse hyaluronan chains (0.12 - 1x106 Da), and HAS1 even smaller hyaluronan chains (0.12 x 106 Da on average), suggesting that membrane preparations lack accessory regulatory components present in intact cells45. Notably, Itano et al.52 have reported that HAS3 protein synthesizes shorter hyaluronan chains than HAS1 and HAS2, however, it should be emphasized that these studies were carried out with different cell types. Thus, it is possible that hyaluronan chain length might be controlled in a cell and physiology specific manner, due to differences in the presence of regulatory proteins that may affect HAS catalytic activities and control chain length termination. Several carcinomas are enriched in hyaluronan, suggesting that high HAS activities are expressed by the tumor cells themselves or by stromal cells. However, low hyaluronan levels have been detected in the conditioned media and cell layers of several tumor cell lines in vitro. For example, mesothelial cells synthesize large amounts of hyaluronan and express all three HAS isoforms at a high level, whereas several mesothelioma cell lines synthesize only minute amounts of hyaluronan and do not express all HAS isoforms, e.g. the Mero-14 mesothelioma cell line expresses a HAS3 transcript that does not generate detectable amounts of hyaluronan47, 53. The mechanisms for loss of hyaluronan production upon transformation of mesothelial cells is not known; nor have mutations of HAS genes during cell transformation been demonstrated. Knowing that about 20% of epithelial mesotheliomas synthesize hyaluronan and that increased serum hyaluronan levels correlate to tumor burden, we have investigated the effect of hyaluronan production on the malignant properties of mesothelioma cells. Upon overproduction of hyaluronan after transfection with HAS2 cDNA, the hyaluronan-producing mesothelioma cells acquired an increased malignant phenotype. The HAS2-transfectants acquired a fibroblastic migratory phenotype compared to epithelioid mock-transfectants, and were surrounded by hyaluronan-rich pericellular matrices. Furthermore, hyaluronan-producing mesotheliomas express elevated amounts of CD44 and the capacity to proliferate in the absence of solid substrate, compared to non-hyaluronan synthesizing mesotheliomas54. These studies suggest that the local invasive behavior of mesotheliomas correlates with their hyaluronan synthesizing capacity. The importance of HAS2 and HYAL1 in tumor development has also been investigated further using colon, breast and prostate carcinoma models both in vitro and in vivo55-57. These studies indicated that HAS2 overexpression leads to faster development of transplantable tumors in syngeneic rats, compared to mock-transfectants. In contrast, HYAL1 overexpression suppresses the growth rate of colon tumor cells both in vitro and in vivo55. This is consistent with the observation that colorectal carcinoma patients with large amounts of hyaluronan have an unfavorable prognosis. The tumor suppressive effect of hyaluronidases has also been demonstrated in breast cancer xenografts, where intravenous injections of hyaluronidase reduced tumor volume, hyaluronan content and CD44 variant expression56. Importantly, the concurrent expression of both HAS2 and HYAL1 enhanced the tumorigenic potential of prostate tumor cells, promoting both growth and metastasis, compared to overexpression of HAS2 only57, 58. This observation further illustrates the tumor-promoting and tumorsuppressing functions of HYAL1 that most likely are cell type and concentration dependent59. 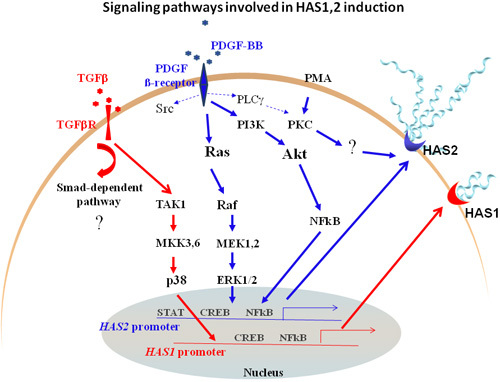 Thus, identification of the regulatory signals that modulate the concerted activities of HASs and HYALs during tumor progression is highly warranted. Additionally, the importance of HAS2 activity for maintenance of the malignant phenotype of breast cancer cells was investigated by specifically silencing the HAS2 protein using antisense inhibition or specific siRNAs. HAS2 silencing in breast cancer cells strongly attenuates their motility and malignant phenotype, suggesting that constitutive HAS2 expression promotes breast carcinoma aggressiveness48, 60. Interestingly, exogenous addition of hyaluronan did not restore the silenced HAS2-mediated phenotype, suggesting that tumor-produced hyaluronan may act intracellularly or have other functional properties than exogenous hyaluronan24. However, addition of exogenous hyaluronan to other tumor cell cultures activated intracellular signaling via the hyaluronan receptor, CD4427. The functional contributions of exogenous and endogenous hyaluronan in cellular fate are still puzzling. A future challenge is to elucidate this complexity. Our knowledge of where and when hyaluronan is produced has increased, but the detailed regulatory mechanisms are not clear. Hyaluronan synthesizing and processing enzymes exhibit a variable expression pattern between various normal cell types of mesenchymal origin, between normal cells and their transformed counterparts or between tumor cells with different degrees of malignancy. Possibly, each isoform imparts a novel hyaluronan phenotype to various cell types that as an integral component modulates their physiology. Mesenchymal cells, such as human foreskin fibroblasts and mesothelial cells, exhibit differences in their hyaluronan synthesizing capacity in response to extracellular regulatory signals including PDGF-BB, phorbol 12-myristate 13-acetate (PMA) and TGF-β PMA stimulates hyaluronan production more potently than PDGF-BB, and TGF-β induces hyaluronan synthesis less efficiently47, 61. PMA and PDGF-BB exert their stimulatory effects on hyaluronan synthesis by mesothelial cells, primarily through induction of the HAS2 gene47. The stimulatory activity of PDGF-BB or TGF-β leads to synthesis of high molecular mass hyaluronan chains (larger than 2 x 106), whereas PMA stimulation leads to hyaluronan of polydisperse size47. The fact that the HAS2 isoform synthesizes hyaluronan molecules of high molecular mass45, and that PKC has an important role in stimulation by both PMA and PDGF-BB62, suggests that different external signals regulate both the amounts and sizes of hyaluronan. This possibly occurs via activation of existing HAS molecules and most likely involves direct regulatory phosphorylation or phosphorylation of other components that in turn activate HAS proteins, as well as induction of new enzyme molecules. Recent studies have demonstrated that HAS3 is phosphorylated, and that Heregulin stimulation induces the phosphorylation of each one of the three HAS isoforms63, 64. The physiological importance and the regulatory mechanisms underlying post-translational modifications of HAS isoforms, such as phosphorylation and ubiquitination, and their effect on stability and activity, have only begun to be elucidated. Analysis of the promoter regions of vertebrate HAS genes revealed a tighter promoter regulatory control for HAS2 than for HAS1 and HAS3 genes; the proximal promoter of HAS2 possesses transcription factor binding sites for NF- kB, STATs and CREB65, 66. Several laboratories, including our own, have investigated the mechanisms involved in regulation of the expression of each one of the HAS and HYAL genes. Since there were differences in the experimental systems and conditions, including cell type, growth factors and cytokines used, comparisons between different studies are difficult to make. A general view that is emerging is that different cell types exhibit variable levels of each of the HAS and HYAL genes, and respond to growth factors and cytokines differentially. A summary of the regulation of hyaluronan synthesis in cells of mesenchymal origin is depicted in Table 1. Human normal mesothelial cells from pleura express constitutively all three HAS transcripts at high levels47. In other cell types, HAS1 transcripts are hardly detected constitutively, but are strongly upregulated in response to stimuli in most of the cells investigated. In particular, studies on cells isolated from synovium have ascribed the HAS1 gene as having a culprit function responsible for the aberrant accumulation of hyaluronan in rheumatoid arthritis, since it is the only HAS gene that strongly responds to several pro-inflammatory stimuli and is blocked by drugs used in treatment67, 68. High constitutive HAS2 mRNA expression was seen in all cell types studied. Dramatic differences in the growth factor inducibility of the HAS2 gene was observed. PDGF-BB increases the mRNA levels in both dermal and lung fibroblasts as well as in mesothelial cells, whereas TGF-β suppresses HAS2 expression in mesothelial cells and hardly affects its expression in synoviocytes1, 47, 69, 70. It is interesting to note that the HAS2 transcript is markedly suppressed in response to hydrocortisone and dexamethasone in dermal fibroblasts, osteoblasts and mesothelial cells47, 70. HAS2 mRNA readily responds not only to PDGF-BB and TGF-β, but also to IL-1 and tumor necrosis factor (TNF)-γ in several other cells, including corneal keratocytes, smooth muscle cells, oral fibroblasts, chondrocytes and microvascular endothelial cells. The levels of HAS3 mRNA in resting cells varied considerably in different cell types, but its response to stimuli was moderate (Table 1). Notably, HAS2 gene expression is about 900-fold above that of other HAS isoforms in dermal fibroblasts, despite the variation in expression levels without or after stimuli, suggesting that HAS2 possibly accounts for most of the secretion of hyaluronan by these cells. Despite the importance of hyaluronidases in tumor progression and inflammation, very little is known about the regulatory mechanisms that modulate their expression and activities. A few studies have demonstrated that hyaluronidases in normal and tumor tissues are regulated at the transcriptional level1, 69, 71, 72. Studies on human dermal fibroblasts revealed that PDGF-BB triggers the induction of mRNA for HYAL1, but does not significantly affect the constitutive mRNA expression of HYAL2 nor the HYAL-like activities1 (Table 1). Notably, TGF-β-stimulated dermal fibroblasts exhibit increased HYAL-like activity suggesting a regulatory mechanism by TGF-β at the post-translational level1. Studies in mouse lung fibroblasts also demonstrate that PDGF-BB has no stimulatory effect on HYAL-like activity. However, in these cells TGF-β stimulates HYAL2 expression but has no effect on HYAL1 gene expression (Table 1)69. Additionally, pro-inflammatory cytokines such as TNF-α and IL-1β act in a synergistic fashion to induce the expression of HYAL genes and HYAL-like activities71. Obviously, additional studies are needed in order to elucidate the mechanisms by which cellular and environmental factors can modulate the expressions and activities of each HYAL in normal and pathological conditions. A few studies have examined the intracellular signaling pathways through which PDGF and TGF-β mediate regulation of HAS expression and hyaluronan production. The mechanism whereby PDGF-BB stimulates hyaluronan synthesis in dermal fibroblasts was investigated using specific inhibitors for downstream signaling molecules. The analysis revealed that the Erk MAP kinase pathway and the phosphatidylinositol 3´-kinase (PI3K) pathway are important in mediating PDGF-BB-dependent hyaluronan synthesis. Furthermore, blocking the translocation of active NF-kB complexes into the nucleus suppressed hyaluronan production, indicating that this pathway is also important. Notably, the PDGF-BB-induced stimulation of hyaluronan did not require Src and p38 MAPK signaling pathways1. The fact that the HAS2 proximal promoter sequence has common putative transcription factor binding sites for CREB and NF-kB, which are downstream of Erk MAPK and PI3K signaling, is consistent with our findings. TGF-β signals via activation of Smad complexes, as well as by induction of the Erk MAPK pathways. Interestingly, p38 MAPK signaling was identified as the main pathway through which TGF-β induces the expression of the HAS1 gene in synoviocytes, whereas the Erk and JNK MAPK pathways were less important67. Fig. 3 depicts a model for signaling downstream of growth factor receptors that are involved in HAS gene regulation. More recently, the regulation of hyaluronan has been studied in fibrosarcoma cell cultures, in response to autocrine release of growth factors73. HAS1 and HAS2 mRNAs were the most predominantly upregulated transcripts in response to PDGF-BB and TGF-β, indicating their prominent involvement in the synthesis of hyaluronan and its deposition in the stroma by both tumor and stromal cells. The further dissection of such pathways might allow us to control the endogenous production of hyaluronan in disease, and reveal its essential roles in tissue homeostasis and cellular functions. Fig. 3　Signaling pathways downstream of PDGF β-receptor and TGFβR that promote HAS1 and HAS2 gene regulation. Thick arrows show the main pathways through which PDGF (blue arrows) and TGF-β (red arrows) modulate HAS1 and HAS2 transcript expression. Less important pathways in mediating hyaluronan synthesis are depicted by dotted arrows. Our knowledge of the normal and pathological roles of hyaluronan has increased during the recent years. However, much is still unknown about the mechanisms that regulate the synthesis and degradation of HASs and HYALs. Future progress along these lines of research is dependent on the development of tools for specific characterization of each one of the HASs and HYALs at both the gene and protein levels. These enzymes are attractive targets for manipulation of the amount and size of hyaluronan in tissues. Moreover, the mechanisms whereby growth factors stimulate hyaluronan synthesis need to be elucidated, as well as the role of CD44 and RHAMM in interactions with growth factor receptors. Most interesting, recent studies have demonstrated that p53 represses the expression of both CD44 and RHAMM74, 75. Thus, hyaluronan is aberrantly accumulated during tumor-progression and the receptors CD44 and RHAMM are upregulated in tumors with p53 mutations. The possibility that hyaluronan-activated CD44 and RHAMM complexes cooperate in tumorigenesis deserves to be explored. I would like to thank past and present members in my laboratory for their invaluable contributions to our work as well as Dr. Carl-Henrik Heldin for stimulating conversations and feedback. I also thank Drs Bryan Toole and Vincent Hascall for critical review of this manuscript. These studies were funded by Ludwig Institute for Cancer Research, The Swedish Cancer Foundation, Uppsala University, Wenner-Gren Foundation, King Gustav V:s 80-years Foundation, Q-Med and Mizutani Foundation for Glycoscience. Last but not least, I would like to apologize for not referring to many excellent studies because of space limitation. 1. Li L, Asteriou T, Bernert B, Heldin CH, Heldin P. Growth factor regulation of hyaluronan synthesis and degradation in human dermal fibroblasts: importance of hyaluronan for the mitogenic response of PDGF-BB. Biochem J 404, 327-36, 2007. 2. Termeer C, Benedix F, Sleeman J, Fieber C, Voith U, Ahrens T, Miyake K, Freudenberg M, Galanos C, Simon JC. Oligosaccharides of Hyaluronan activate dendritic cells via toll-like receptor 4. J Exp Med 195, 99-111, 2002. 3. Nilsson SK, Haylock DN, Johnston HM, Occhiodoro T, Brown TJ, Simmons PJ. Hyaluronan is synthesized by primitive hemopoietic cells, participates in their lodgment at the endosteum following transplantation, and is involved in the regulation of their proliferation and differentiation in vitro. Blood 101, 856-62, 2003. 4. Csoka AB, Frost GI, Stern R. The six hyaluronidase-like genes in the human and mouse genomes. Matrix Biol 20, 499-508, 2001. 5. Weigel PH, Hascall VC, Tammi M. Hyaluronan synthases. J. Biol. Chem. 272, 13997-4000, 1997. 6. Weigel PH, DeAngelis PL. Hyaluronan Synthases: Hyaluronan Synthases: A Decade-plus of Novel Glycosyltransferases. J Biol Chem 282, 36777-81, 2007. 7. Stern R. Hyaluronidases in cancer biology. Semin Cancer Biol 18, 275-80, 2008. 8. Turley EA, Noble PW, Bourguignon LY. Signaling properties of hyaluronan receptors. J Biol Chem 277, 4589-92, 2002. 9. Evanko SP, Wight TN. Intracellular localization of hyaluronan in proliferating cells. J Histochem Cytochem 47, 1331-42, 1999. 10. Day AJ, de la Motte CA. Hyaluronan cross-linking: a protective mechanism in inflammation? Trends Immunol 26, 637-43, 2005. 11. Kalluri R, Zeisberg M. Fibroblasts in cancer. Nat Rev Cancer 6, 392-401, 2006. 12. Stern R, Asari AA, Sugahara KN. Hyaluronan fragments: an information-rich system. Eur J Cell Biol 85, 699-715, 2006. 13. Boregowda RK, Appaiah HN, Siddaiah M, Kumarswamy SB, Sunila S, Thimmaiah KN, Mortha K, Toole B, Banerjee S. Expression of hyaluronan in human tumor progression. J Carcinog 5, 2, 2006. 14. Auvinen P, Tammi R, Parkkinen J, Tammi M, Agren U, Johansson R, Hirvikoski P, Eskelinen M, Kosma VM. Hyaluronan in peritumoral stroma and malignant cells associates with breast cancer spreading and predicts survival. Am J Pathol 156, 529-36, 2000. 15. Koyama H, Hibi T, Isogai Z, Yoneda M, Fujimori M, Amano J, Kawakubo M, Kannagi R, Kimata K, Taniguchi S, Itano N. Hyperproduction of hyaluronan in neu-induced mammary tumor accelerates angiogenesis through stromal cell recruitment: possible involvement of versican/PG-M. Am J Pathol 170, 1086-99, 2007. 16. Koyama H, Kobayashi N, Harada M, Takeoka M, Kawai Y, Sano K, Fujimori M, Amano J, Ohhashi T, Kannagi R, Kimata K, Taniguchi S, et al. Significance of tumor-associated stroma in promotion of intratumoral lymphangiogenesis: pivotal role of a hyaluronan-rich tumor microenvironment. Am J Pathol 172, 179-93, 2008..
18. Knudson CB. Hyaluronan and CD44: strategic players for cell-matrix interactions during chondrogenesis and matrix assembly. Birth Defects Res C Embryo Today 69, 174-96, 2003. 19. Heldin P, Suzuki M, Teder P, Pertoft H. Chondroitin sulfate proteoglycan modulates the permeability of hyaluronan-containing coats around normal human mesothelial cells. J. Cell Physiol. 165, 54-61, 1995. 20. McBride WH, Bard JB. 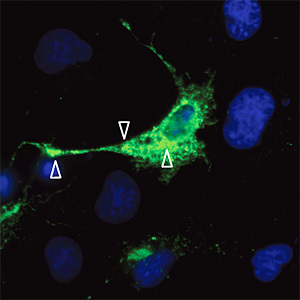 Hyaluronidase-sensitive halos around adherent cells. Their role in blocking lymphocyte-mediated cytolysis. J Exp Med 149, 507-15, 1979. 21. Zoltan-Jones A, Huang L, Ghatak S, Toole BP. Elevated hyaluronan production induces mesenchymal and transformed properties in epithelial cells. J Biol Chem 278, 45801-10, 2003. 22. Toole BP. Hyaluronan in morphogenesis. Semin Cell Dev Biol 12, 79-87, 2001. 23. Toole BP. Hyaluronan: from extracellular glue to pericellular cue. Nat Rev Cancer 4, 528-39, 2004. 24. Toole BP, Slomiany MG. Hyaluronan: a constitutive regulator of chemoresistance and malignancy in cancer cells. Semin Cancer Biol 18, 244-50, 2008. 25. Toole BP, Zoltan-Jones A, Misra S, Ghatak S. Hyaluronan: a critical component of epithelial-mesenchymal and epithelial-carcinoma transitions. Cells Tissues Organs 179, 66-72, 2005. 26. Orian-Rousseau V, Ponta H. Adhesion proteins meet receptors: a common theme? Adv Cancer Res 101, 63-92, 2008. 27. Bourguignon LY. Hyaluronan-mediated CD44 activation of RhoGTPase signaling and cytoskeleton function promotes tumor progression. Semin Cancer Biol 18, 251-9, 2008. 28. Li L, Heldin CH, Heldin P. Inhibition of platelet-derived growth factor-BB-induced receptor activation and fibroblast migration by hyaluronan activation of CD44. J Biol Chem 281, 26512-9, 2006. 29. Kaya G, Rodriguez I, Jorcano JL, Vassalli P, Stamenkovic I. Selective suppression of CD44 in keratinocytes of mice bearing an antisense CD44 transgene driven by a tissue-specific promoter disrupts hyaluronate metabolism in the skin and impairs keratinocyte proliferation. Genes Dev 11, 996-1007, 1997. 30. Ito T, Williams JD, Fraser D, Phillips AO. Hyaluronan attenuates transforming growth factor-beta1-mediated signaling in renal proximal tubular epithelial cells. Am J Pathol 164, 1979-88, 2004. 31. Mattila E, Pellinen T, Nevo J, Vuoriluoto K, Arjonen A, Ivaska J. Negative regulation of EGFR signalling through integrin-alpha1beta1-mediated activation of protein tyrosine phosphatase TCPTP. Nat Cell Biol 7, 78-85, 2005. 32. Marhaba R, Zoller M. CD44 in cancer progression: adhesion, migration and growth regulation. J Mol Histol 35, 211-31, 2004. 33. Misra S, Ghatak S, Toole BP. Regulation of MDR1 expression and drug resistance by a positive feedback loop involving hyaluronan, phosphoinositide 3-kinase, and ErbB2. J Biol Chem 280, 20310-5, 2005. 34. Misra S, Toole BP, Ghatak S. Hyaluronan constitutively regulates activation of multiple receptor tyrosine kinases in epithelial and carcinoma cells. J Biol Chem 281, 34936-41, 2006. 35. Hanahan D, Folkman J. Patterns and emerging mechanisms of the angiogenic switch during tumorigenesis. Cell 86, 353-64, 1996. 36. Adams RH, Alitalo K. Molecular regulation of angiogenesis and lymphangiogenesis. Nat Rev Mol Cell Biol 8, 464-78, 2007. 37. Cross MJ, Claesson-Welsh L. FGF and VEGF function in angiogenesis: signalling pathways, biological responses and therapeutic inhibition. Trends Pharmacol Sci 22, 201-7, 2001. 38. Jakobsson L, Claesson-Welsh L. Vascular basement membrane components in angiogenesis--an act of balance. ScientificWorldJournal 8, 1246-9, 2008. 39. Slevin M, Krupinski J, Gaffney J, Matou S, West D, Delisser H, Savani RC, Kumar S. Hyaluronan-mediated angiogenesis in vascular disease: uncovering RHAMM and CD44 receptor signaling pathways. Matrix Biol 26, 58-68, 2007. 40. Noble PW. Hyaluronan and its catabolic products in tissue injury and repair. Matrix Biol 21, 25-9, 2002. 41. West DC, Hampson IN, Arnold F, Kumar S. Angiogenesis induced by degradation products of hyaluronic acid. Science 228, 1324-6, 1985. 42. Slevin M, Kumar S, Gaffney J. Angiogenic oligosaccharides of hyaluronan induce multiple signaling pathways affecting vascular endothelial cell mitogenic and wound healing responses. J Biol Chem 277, 41046-59, 2002. 43. Cao G, Savani RC, Fehrenbach M, Lyons C, Zhang L, Coukos G, Delisser HM. 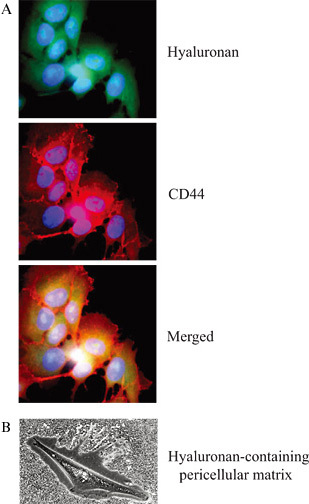 Involvement of endothelial CD44 during in vivo angiogenesis. Am J Pathol 169, 325-36, 2006. 44. Takahashi Y, Li L, Kamiryo M, Asteriou T, Moustakas A, Yamashita H, Heldin P. Hyaluronan fragments induce endothelial cell differentiation in a CD44- and CXCL1/GRO1-dependent manner. J. Biol. Chem. 280, 24195-204, 2005. 45. Brinck J, Heldin P. Expression of recombinant hyaluronan synthase (HAS) isoforms in CHO cells reduces cell migration and cell surface CD44. Exp. Cell Res. 252, 342-51, 1999. 46. Itano N, Sawai T, Miyaishi O, Kimata K. Relationship between hyaluronan production and metastatic potential of mouse mammary carcinoma cells. Cancer Res. 59, 2499-504, 1999. 47. Jacobson A, Brinck J, Briskin MJ, Spicer AP, Heldin P. Expression of human hyaluronan synthases in response to external stimuli. Biochem. J. 348, 29-35, 2000. 48. Li Y, Li L, Brown TJ, Heldin P. Silencing of hyaluronan synthase 2 suppresses the malignant phenotype of invasive breast cancer cells. Int J Cancer 120, 2557-67, 2007. 49. Adamia S, Reiman T, Crainie M, Mant MJ, Belch AR, Pilarski LM. Intronic splicing of hyaluronan synthase 1 (HAS1): a biologically relevant indicator of poor outcome in multiple myeloma. Blood 105, 4836-44, 2005. 51. Rilla K, Siiskonen H, Spicer AP, Hyttinen JM, Tammi MI, Tammi RH. Plasma membrane residence of hyaluronan synthase is coupled to its enzymatic activity. J Biol Chem 280, 31890-7, 2005. 52. Itano N, Sawai T, Yoshida M, Lenas P, Yamada Y, Imagawa M, Shinomura T, Hamaguchi M, Yoshida Y. Three isoforms of mammalian hyaluronan synthases have distinct enzymatic properties. J. Biol. Chem. 274, 25085-92, 1999. 53. Asplund T, Versnel MA, Laurent TC, Heldin P. Human mesothelioma cells produce factors that stimulate the production of hyaluronan by mesothelial cells and fibroblasts. Cancer Res. 53, 388-92, 1993. 54. Li Y, Heldin P. Hyaluronan production increases the malignant properties of mesothelioma cells. Br. J. Cancer 85, 600-7, 2001. 55. Jacobson A, Rahmanian M, Rubin K, Heldin P. Expression of hyaluronan synthase 2 or hyaluronidase 1 differentially affect the growth rate of transplantable colon carcinoma cell tumors. Int. J. cancer 102, 212-9, 2002. 56. Shuster S, Frost GI, Csoka AB, Formby B, Stern R. Hyaluronidase reduces human breast cancer xenografts in SCID mice. Int J Cancer 102, 192-7, 2002. 58. Bharadwaj AG, Kovar JL, Loughman E, Elowsky C, Oakley GG, Simpson MA. Spontaneous Metastasis of Prostate Cancer Is Promoted by Excess Hyaluronan Synthesis and Processing. Am J Pathol 174, 1027-36, 2009. 59. Lokeshwar VB, Cerwinka WH, Isoyama T, Lokeshwar BL. HYAL1 hyaluronidase in prostate cancer: a tumor promoter and suppressor. Cancer Res 65, 7782-9, 2005. 60. Udabage L, Brownlee GR, Waltham M, Blick T, Walker EC, Heldin P, Nilsson SK, Thompson EW, Brown TJ. Antisense-mediated suppression of hyaluronan synthase 2 inhibits the tumorigenesis and progression of breast cancer. Cancer Res 65, 6139-50, 2005. 61. Suzuki M, Asplund T, Yamashita H, Heldin C-H, Heldin P. Stimulation of hyaluronan biosynthesis by platelet-derived growth factor-BB and transforming growth factor-b1 involves activation of protein kinase C. Biochem. J. 307, 817-21, 1995. 62. Heldin P, Asplund T, Ytterberg D, Thelin S, Laurent TC. Characterization of the molecular mechanism involved in the activation of hyaluronan synthetase by platelet-derived growth factor in human mesothelial cells. Biochem. J. 283, 165-70, 1992. 63. Goentzel BJ, Weigel PH, Steinberg RA. Recombinant human hyaluronan synthase 3 is phosphorylated in mammalian cells. Biochem J 396, 347-54, 2006. 64. Bourguignon LY, Gilad E, Peyrollier K. Heregulin-mediated ErbB2-ERK signaling activates hyaluronan synthases leading to CD44-dependent ovarian tumor cell growth and migration. J Biol Chem 282, 19426-41, 2007. 65. Saavalainen K, Pasonen-Seppanen S, Dunlop TW, Tammi R, Tammi MI, Carlberg C. The human hyaluronan synthase 2 gene is a primary retinoic Acid and epidermal growth factor responding gene. J Biol Chem 280, 14636-44, 2005. 66. Monslow J, Williams JD, Fraser DJ, Michael DR, Foka P, Kift-Morgan AP, Luo DD, Fielding CA, Craig KJ, Topley N, Jones SA, Ramji DP, Bowen T. Sp1 and Sp3 mediate constitutive transcription of the human hyaluronan synthase 2 gene. J Biol Chem 281, 18043-50, 2006. 67. Stuhlmeier KM, Pollaschek C. Differential effect of transforming growth factor beta (TGF-βeta) on the genes encoding hyaluronan synthases and utilization of the p38 MAPK pathway in TGF-βeta-induced hyaluronan synthase 1 activation. J Biol Chem 279, 8753-60, 2004. 68. Stuhlmeier KM. Aspects of the biology of hyaluronan, a largely neglected but extremely versatile molecule. Wien Med Wochenschr 156, 563-8, 2006. 69. Li Y, Rahmanian M, Widstrom C, Lepperdinger G, Frost GI, Heldin P. Irradiation-induced expression of hyaluronan (HA) synthase 2 and hyaluronidase 2 genes in rat lung tissue accompanies active turnover of HA and induction of types I and III collagen gene expression. Am J Respir Cell Mol Biol 23, 411-8, 2000. 70. Zhang W, Watson CE, Liu C, Williams KJ, Werth VP. Glucocorticoids induce a near-total suppression of hyaluronan synthase mRNA in dermal fibroblasts and in osteoblasts: a molecular mechanism contributing to organ atrophy. Biochem J 349, 91-7, 2000. 71. Monzon ME, Manzanares D, Schmid N, Casalino-Matsuda SM, Forteza RM. Hyaluronidase expression and activity is regulated by pro-inflammatory cytokines in human airway epithelial cells. Am J Respir Cell Mol Biol 39, 289-95, 2008. 72. Lokeshwar VB, Gomez P, Kramer M, Knapp J, McCornack MA, Lopez LE, Fregien N, Dhir N, Scherer S, Klumpp DJ, Manoharan M, Soloway MS, Lokeshwar BL. Epigenetic regulation of HYAL-1 hyaluronidase expression. identification of HYAL-1 promoter. J Biol Chem 283, 29215-27, 2008. 73. Berdiaki A, Zafiropoulos A, Fthenou E, Katonis P, Tsatsakis A, Karamanos NK, Tzanakakis GN. Regulation of hyaluronan and versican deposition by growth factors in fibrosarcoma cell lines. Biochim Biophys Acta 1780, 194-202, 2008. 74. Sohr S, Engeland K. RHAMM is differentially expressed in the cell cycle and downregulated by the tumor suppressor p53. Cell Cycle 7, 3448-60, 2008. 75. Godar S, Ince TA, Bell GW, Feldser D, Donaher JL, Bergh J, Liu A, Miu K, Watnick RS, Reinhardt F, McAllister SS, Jacks T, Weinberg RA. Growth-inhibitory and tumor- suppressive functions of p53 depend on its repression of CD44 expression. Cell 134, 62-73, 2008.